"This is no dream...this is really happening!" I wonder how many documentary programs have used Mia Farrow's panicked cry to illustrate the dark side of swinging '60s psychedelia? I know I have seen it in more than a few. It's certainly an iconic moment, coming midway through a crucial sequence of Roman Polanski's 1968 chiller Rosemary's Baby. The sweet and trusting Rosemary Woodhouse has been drugged without her knowledge, and her sudden declaration occurs when the surreal fantasy the narcotics instigated intersects with the cruel reality she is suffering: a cult of Satanists have made her their unwilling concubine. Classic horror movies always play on the anxieties of the times. Found footage shockers are popular right now because modern moviegoers are finding themselves increasingly under surveillance in our everyday lives. A film like Paranormal Activity taps into the very real issue of privacy rights and how, more often than not anymore, we surrender much of those rights ourselves. Who filmed the footage in that movie? One of the victims. Who turns out to be the murderer? Someone close to him. The killer isn't just in the house, but you're sharing the same modem. And so it is that Polanski, working from a novel by Ira Levin, builds a scary story that spreads itself across the generation gap. The malevolent forces that prey on the Woodmans are older people, and they dig at Rosemary's anxieties about motherhood, about creating new life and being a parent to the next generation. The metaphor? That change is happening and we might not be ready to handle what's next. There may be a riot going on, but no one is sure they can really take charge when they get what they want. Or, if you prefer, Rosemary's Baby is simply a story about a woman caught up in weird goings on, and how she slowly realizes that not all is right with her neighbors, their friends, or even her husband (an earnest and ever-brilliant John Cassavetes). The film intensifies on a slow burn, building the weirdness slowly, shifting from goofy to scary by degrees, and yet never losing its black sense of humor. 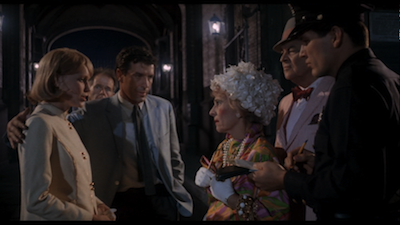 In a lot of ways Rosemary's Baby is camp, but it's pure camp, as equal in its sincerity as a piece of genre fiction as it is full of cinematic pranksterism. (Ever notice that the villain's name, Roman Castevet, not only shares a first name with the writer/director, but the last name sounds suspiciously like that of its male lead?) There are lots of funny, killer details that almost look like kitsch all these decades later. Ruth Gordon's pink hair, or the paintings on the Castevet wall, which include a rendering of a famous fire and a parody of more traditional religious and patriotic paintings that features deformed devil worshipers attacking an innocent. Most of this is clearly intentional, and some of it has only gotten funnier with age. I mean, could they have known Charles Grodin would become Charles Grodin and how ludicrous that sad moustache of his would end up looking? Which isn't me watching Rosemary's Baby from a hipster's perch, giggling at how old fashioned and tacky it is, because I wouldn't use either of those disdainful phrases. On the contrary, I have a lot of respect for how brilliantly Polanski skewers both the young and the old. The character of Guy Woodhouse is a would-be actor who pays lip service to art but is really just looking to get famous (apparently this is not a new societal malady). Next to him, the Satanists almost look harmless. They may be corny, but they believe in something. Guy will sell out anyone. Amidst all of this kidding around, however, is a serious scary movie. Polanski uses humor to set his audience at ease, and then he strikes from the other direction. Tense journeys into dark hallways, ominous portents, and even the occasional gore--he never lets us forget that something isn't quite right in the top floor apartment. 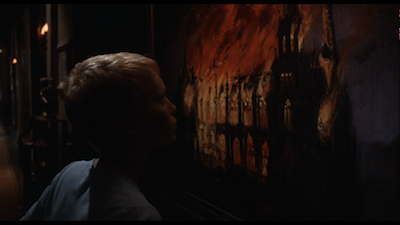 The dream sequences in Rosemary's Baby are some of the best ever in a film. 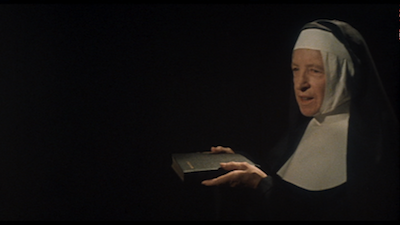 Polanski establishes a wonky logic in Rosemary's nightmares, one that is as random as it is contrived, leading us from the boogie men of her subconscious to the honest-to-goodness boogie men all around her. 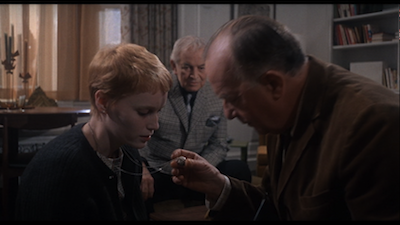 Mia Farrow is kind of remarkable in the role. She manages to maintain a believable innocence, even when the armchair quarterbacks in the audience should otherwise be screaming, "Oh, come on, how can you not tell something is wrong?" Again, the most insidious writing goes to Cassavetes. The way the husband tweaks at his wife's insecurities to keep her from disrupting the plan is laced with a cold cruelty. If one wanted to read too much into it, there are maybe some unkind (and not necessarily true) parallels to be made between this performance and the driven man who gave it, not to mention the filmmaker who shaped it. 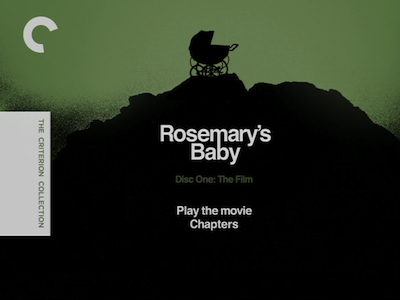 Rosemary's Baby has been on out-of-print on DVD in North America for some time now, and the new Criterion release has been manufactured in high-definition (there is also a Blu-Ray version ). The new widescreen disc image looks extraordinary, maintaining the unreality even as it improves on the overall clarity and resolution. Detail looks incredible--you could spend a ton of time poring over the nooks and crannies in both the Woodman and Castevets' apartments, every prop appears carefully chosen--and yet the new print manages not to sacrifice the exaggerations. The colors in particular have an almost-over-the-top quality. Farrow's yellow sun dress and bright hair is meant to directly contrast with her sickly pallor as the movie progresses, just as the dinginess of the apartment the couple moves into is brightened up by their new decoration, only to become stifling again. 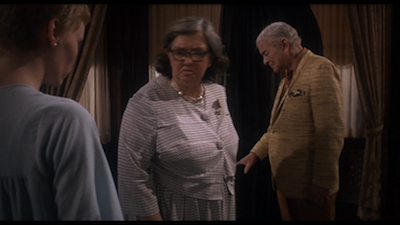 Particularly compare the later apartment scenes to the outdoor shots when Rosemary tries to make a run for it. The sun never sets! In terms of new extras, a featurette featuring current interviews with Roman Polanski, Mia Farrow, and producer Robert Evans is most welcome. 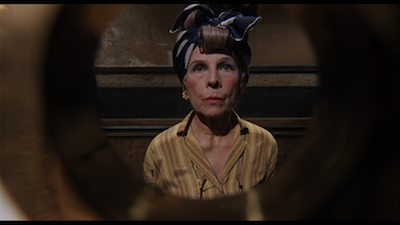 Rosemary's Baby is a film with its own lore. Indeed, I first rented it after watching the documentary The Kid Stays in the Picture , which numbered Rosemary's Baby as one of the amazing string of hits Evans produced as the head of Paramount. There is also Komeda, Komeda, an inviting documentary about music composer Krzystof Komeda, as well as an archival interview with author Ira Levin and some of the author's notes. 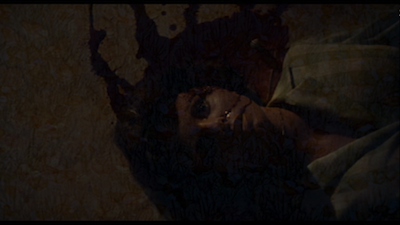 All in all, Rosemary's Baby is an impressive reissue just in time for Halloween. If you're looking for something creepy to watch before the holiday, then throw this on your biggest screen, turn out the lights, and crank it up. Once you're good and scared, just keep reminding yourself, this isn't happening...it's just a dream.